MettleAir® regulators are designed for precision and reliability. Our regulators and lubricators are the best choice when it comes to protecting your pneumatic investments. MettleAir® air pressure regulators are compatible with a wide variety of mounting brackets for easy installation. 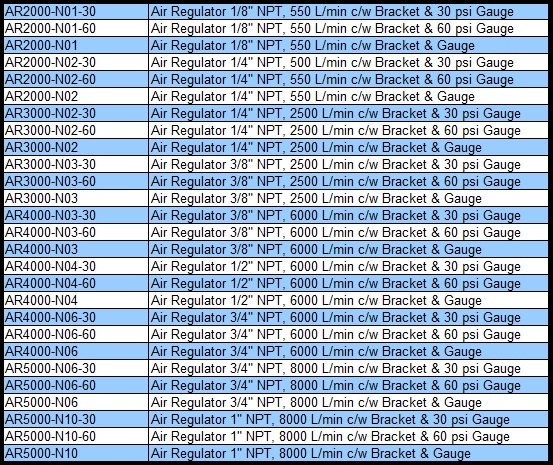 Our full range of air pressure regulators are available in 160 PSI, 60 PSI and 30 PSI regulating ranges with corresponding high precision easy to read gauges. The unique modular design allows for easy upgrades and maintenance. We offer pre-assembled three piece and two piece FRL combos for quick and easy installation.